In the course of discussions with climate change skeptics over the past year or so, I’ve always been amazed that so much denial could persist in the face of so much evidence. In fact, no amount of evidence ever seems to make any difference. Of course, people without science education are often intimidated by charts or unable to properly assess them, but you would still think that photographs or first-hand reports might be persuasive. After all, there is abundant photographic evidence that Arctic ice is melting at such a rapid rate that shipping lanes are now opening up in summer. And many Bangladeshis have seen the effects of rising sea levels first-hand. They can tell you about the incursion of sea water into their agricultural fields. I could multiply the examples endlessly, but the point is that the available evidence takes many forms, many of which are very accessible to folks without a basic science education. Now, here’s an example that is literally outside my window. I live in an area of this country where the scenery is breathtakingly beautiful, and I have what realtors sometimes call a “territorial view” (a realtor’s euphemism for a partial view) from my upstairs windows. On a clear day, I can see six or seven of the 15 glaciers on the slopes of the tallest peak in the Northwest, Mt. Rainier. If I had been alert to what is happening to these glaciers, I might have been making my own photographs of them over the years. Instead, I must rely on TeleAtlas and the U.S. Geological Survey. The glaciers are shrinking. They have lost more than 20 percent of their mass in the past century, releasing debris flows into the rivers and raising the risk of floods. Riverbeds in two nearby cities (Puyallup and Auburn) are rising, fir and cedar trees are standing in water, and the debris is bumping up against the bottoms of bridges and spilling onto roads. Recreational areas such as camp grounds are disappearing. The culprit? Rising temperatures. Less snow. More and heavier rain. It’s the heavy rainfall that triggers the debris flows. Data on the stream flows reveal that major floods on the Nisqually River, which used to occur about every 100 years, now occur about every 14 years. I frequently drive through these areas. I have friends who live in the floodplains. 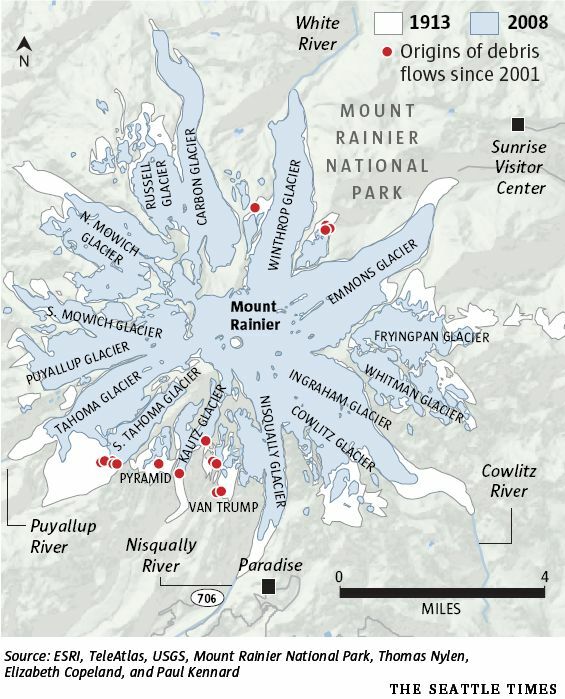 What is happening to Mount Rainer’s 15 glaciers is happening to glaciers worldwide. One would expect that those living in the floodplains of Mt. Rainier’s rivers would now almost uniformly accept the scientific evidence about climate change, regardless of their political or religious affiliations. Instead, I suspect that those whose worldviews rule out global warming scenarios will continue to be unimpressed by the “mountain” of evidence outside their windows. This entry was posted on January 4, 2010 at 4:23 pm and is filed under Climate Change. You can follow any responses to this entry through the RSS 2.0 feed. You can leave a response, or trackback from your own site. I doubt I will agree with a word you write (that’s an overstatement), but I love the looks of your weblog. At least we can agree on that — for starters.